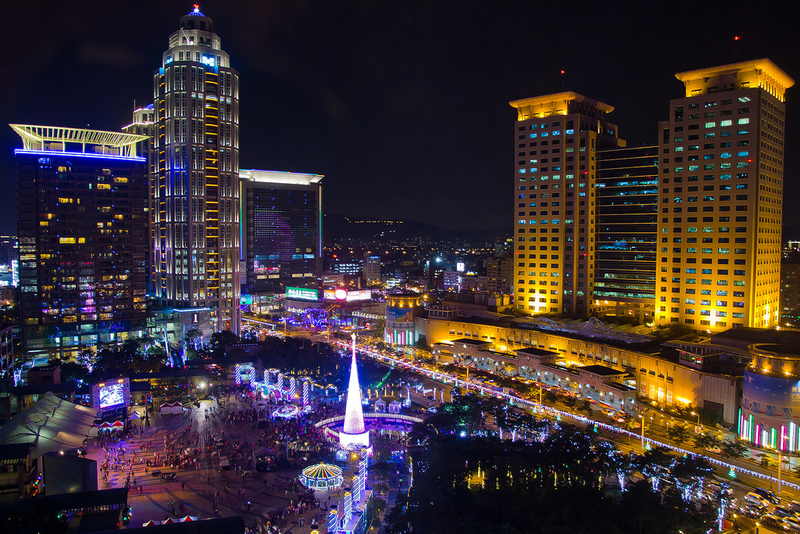 The seat of New Taipei City, Banqiao District is fast becoming a crucial satellite of the Greater Taipei area, with the third highest population density in Taiwan. The district’s rapid-paced urban developments simultaneously echo and respond to its rich history, encapsulated in the famed Lin Family Mansion and Garden historic site, creating a distinctive yet harmonious cityscape, a façade behind which is an extremely liveable area in and of itself. Despite its atmospheric classical Greek central building, water fountain and white sand courtyard, the 435 Art Zone is a vibrant art site. Every corner, every wall is a hidden delight, as the pedestrian-only site is covered in colorful graffiti and cute installation art. 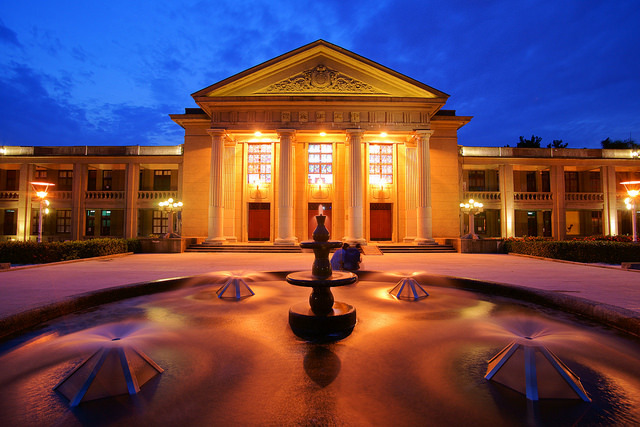 The central building serves as an event venue on weekdays, a movie theater on weekends, housing temporary exhibitions, art classes and performances. Behind the building sits a large elementary school playing field, which is the occasional site of weekend art markets, and the Taiwan Toy Museum, where children can marvel (and play!) with toys, historic to modern, from bikes to diabolos to stilts. Park your car nearby, and at dusk, walk across the Xinyue Bridge to Xinzhuang, taking in the kaleidoscopic, rainbow-colored reflections on the Dahan River. 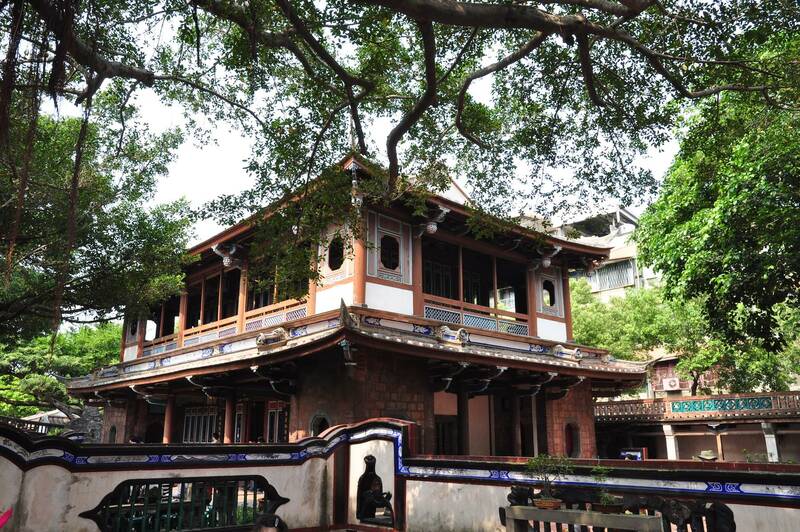 Built by the Lin Ben Yuan family in 1847, The Lin Family Mansion and Garden is the most complete surviving example of traditional Chinese garden architecture, known – along with the Tainan Wu Garden (台南吳園), Hsinchu Beiguo Garden (新竹北郭園), and Wufeng Lin Family Mansion and Garden (霧峰林家宅園) — as the Four Great Gardens of Taiwan (台灣四大名園). Spanning some 20,000 square meters, the expansive, picturesque grounds is overwhelmingly beautiful, with its Three Courtyard Mansion, intricately built and preserved ancient buildings and architecture, towering trees and rare and exotic flora. It’s actually as if you’ve stepped into another historic period entirely. 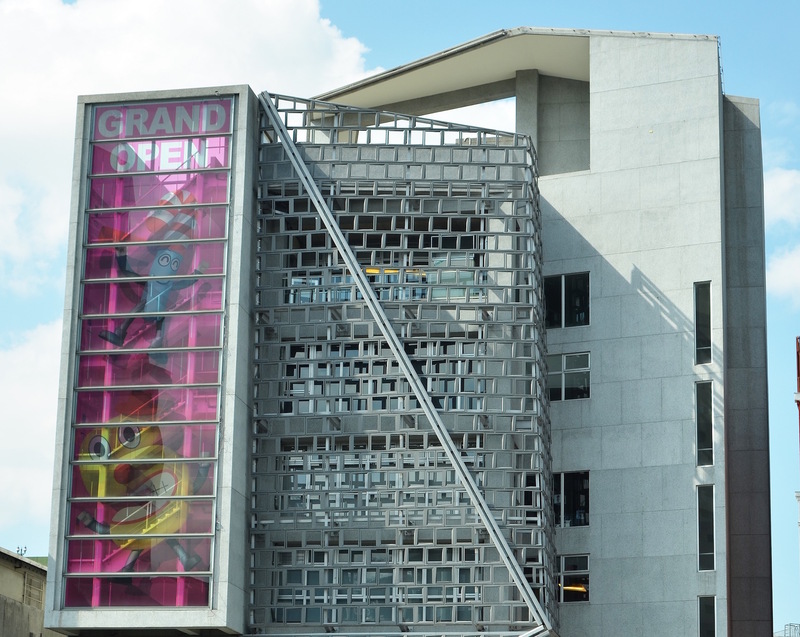 This quirky, modern structure set two national records simultaneously when it opened in 2012, becoming the first theater in Taiwan to be dedicated to animations and to documentaries. The New Taipei City Animation House running from the 2nd to the 8th floors is a lively, interactive space overflowing with libraries, exhibitions, video libraries and activity rooms dedicated to the art of animation. Incorporating several interactive elements, visitors get to experience firsthand the complex but fun process of animation beyond the silver screen. If you’re feeling more grounded (literally! ), head down to the basement, where you will find the New Taipei City Documentary Cinema, dedicated especially to documentaries, their viewing, discussion and promotion, with workshops, events and collections. Following tradition ain’t all bad, particularly when it comes to food. Sitting next to the Cihui Temple is one of Banqiao’s most traditional markets, complete with narrow alleys, old buildings and food stands three decades old. 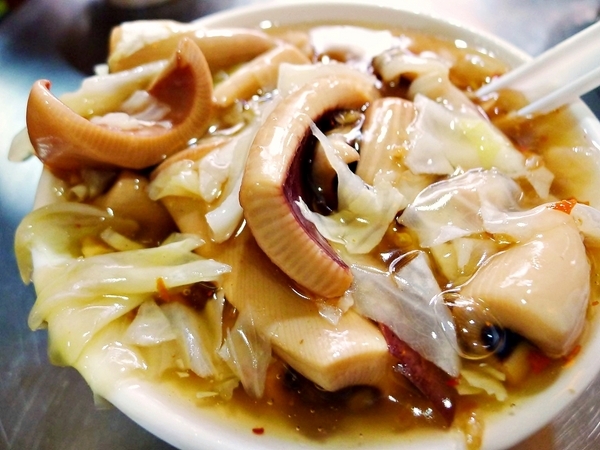 Feast on a squid geng bursting with ingredients and flavor at Gao Ji Squid (高記生炒魷魚), try some turnip cake at the stand adjacent before heading to Hsieh’s Geng (謝家肉羹) for its renowned glutinous oil rice. Cheap, delicious and authentic, Taiwanese cuisine at its finest. It’s not hard to see why Hoo Chuuu Breakfast has often been called the “light of Banqiao”. 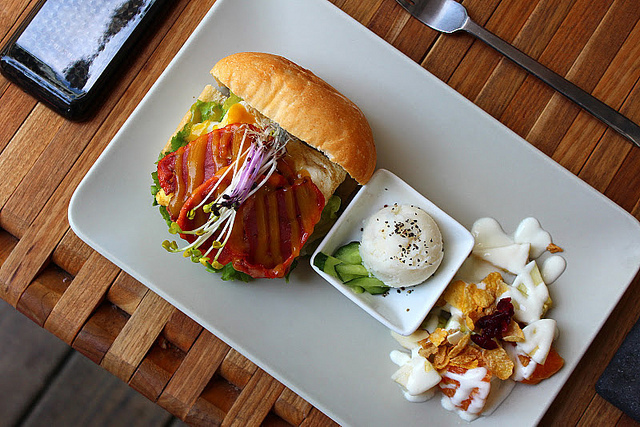 Serving up western style breakfast and brunch options, from salads, paninis, toasts, burgers and various sorts of sandwiches, the breakfast shop has become a congregation spot for brunch lovers and foodies alike. The sun-drenched restaurant itself is at once cozy and clean, and food options, presented beautifully on wooden bowls and white plates, abound. It’s practically impossible to go wrong here, but don’t skip out on Hoo Chuu’s salty black tea, which is a crowd favorite. Do expect a line and that your planned breakfast may become a lunch by the time you’re seated. Xiao Qiao’s story is one of true success; starting out as a tiny, humble roadside stand selling Xinjiang lamb skewers, the shop grew so much in popularity it had established a proper storefront in only a matter of a few short years. 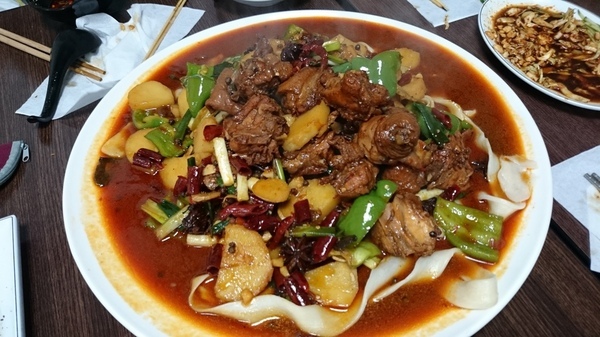 Now extremely popular, the restaurant remains committed to its original mission, serving delicious Xinjiang cuisine at affordable prices and with extremely efficient service for only a 5 percent – and not 10 percent – service charge. Order the lamb skewers, the satay lamb pot (羊肉沙鍋) and dapanji (大盤雞) chicken stew, all mouthwateringly delicious, packed with flavor and with quality ingredients and meat.